CHONGQING, China (CNN) -- Anna He is like a lot of kids about to turn 10. 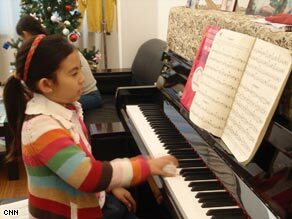 She plays with her brother, fights with her sister, practices piano, hates vegetables and is adapting to her new life -- adapting, because even though she's Chinese, this little girl seems far from happy about living in China. Anna He, 9, finds it hard to adjust to life after she was returned to her biological parents, Jack and Casey He. "I always hate staying in China," she says. "It's one of the worst places I have ever been. When I first went to the big city, there was so [much] pollution and so [it] always makes me feel bad. I also don't like the smell." Her new life in China began after the Tennessee Supreme Court ruled last year that Anna should be returned to her biological parents, Jack and Casey He, known in China as He Shaoqiang and Qin Luo respectively. The decision ended a six-year custody battle. Anna was born prematurely while her parents were in Memphis, Tennessee, on temporary work visas. Unable to cope financially, they decided to give her up temporarily until they were able to get back on their feet. That's when Jerry and Louise Baker stepped in and agreed to take temporary custody of Anna, when she was 4 weeks old. The Bakers said they made a verbal agreement with the Hes to take care of Anna until she was 18. But the Hes dispute that. They wanted their daughter back soon after her first birthday and eventually went to court to have their parental rights restored. After a bitter legal battle, the Hes finally prevailed and Anna was returned to her parents. Anna was given a six-month transition period to adjust to her biological family before the Hes left the United States. Now back in China, Anna is still finding it hard to adjust. Her biological parents have separated since returning to their homeland. Casey He relocated her family from Changsha, China, to Chongqing -- a sprawling mega-city on the banks of the Yangtze River with a population of 32 million. Like most of China's big cities, it's heavily polluted. During the winter, the sun rarely breaks through the heavy brown smog. "Campbell Brown: No Bias No Bull"
CNN's Beijing correspondent John Vause has the latest on this adoption tug-of-war. Jack He says the marriage is over. Casey He appears shaken when asked about her husband and why she packed up and left, with Anna and her younger brother and sister -- Andy, 8, and Avita, 6. "A lot of things were not what I intended and not what I had hoped," said Casey He. She said she would talk about why she left "one day when the kids are bigger." Jack He says the couple disagreed over how they should raise their children. He has limited contact with his family; Anna has seen him only once in the past two months but says she doesn't miss him. Asked why, she said, "I don't know. It's just a feeling in me." Now a single mother, Casey has enrolled all three children in a boarding school during the week. A tough decision, she says, but necessary -- especially for Anna, who was a straight-A student in the U.S. but now struggles because she can't speak Chinese. "I know American people say I am bad, I take the kids to school, this is not good. But in China, the Chinese people don't think so. They study very hard," Casey He said. She lives with her children in a small, two-bedroom apartment; it's clean and sparsely furnished. Casey bought a new piano for Anna and Avita, who are both taking lessons. The apartment and school are both paid for by Casey He's brother, a wealthy businessman. Life is difficult, she says, but she has no doubt that despite Anna's struggle to fit in, the little girl is still better off with her in China rather than living in Memphis with the Bakers. "In China one single mother take three kids -- for me, it is very hard. But I love my kids, mother's love from my heart," said Casey He. "I can take care of the kids. Give them better life." Since her parents split, Anna has re-established regular contact with the Bakers, who call every Saturday. But after more than a year with her biological family, Anna is still unsure of where she would rather be -- with her mom or the Bakers. "I cannot pick anyone. I would die if I would pick one," she said.